It’s one of the most exciting weekends of the year if you’re a Notre Dame Fighting Irish fan. While the football and basketball teams look to continue their undefeated seasons, the hockey squad, ranked sixth in both major college hockey polls, will make the trip to Ann Arbor to take on their rival Michigan Wolverines. It’ll be their second conference series of the season. With this being only their second season in the Big Ten, it’s easy for Irish fans to not get as excited about rivalries on the ice as on the field. 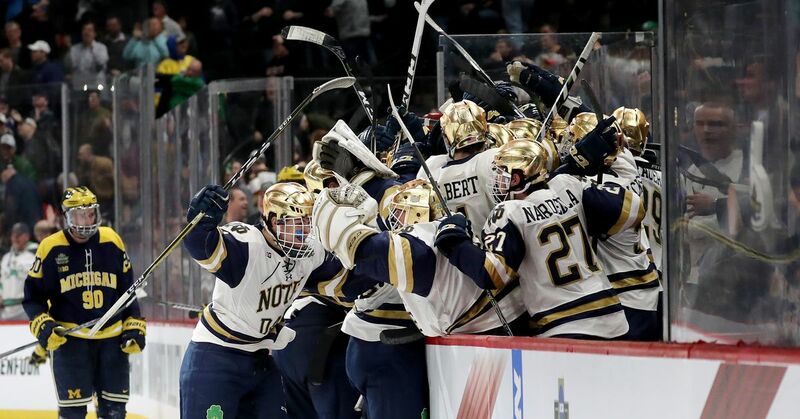 We all know the Notre Dame football team handed Michigan their only loss of 2018 so far, but there was no shortage of excitement when these two teams got together last year in hockey. The schools played two home and homes during the regular season, with Notre Dame sweeping the first and Michigan the second. Then came their matchup in the NCAA semifinal, when former captain Jake Evans broke a 3-3 tie with 5.2 seconds left in the game. Coming off an ugly weekend against the Minnesota-Duluth Bulldogs the week prior, the Irish opened conference play last weekend against the Ohio State Buckeyes at home. It was an encouraging series for goaltender Cale Morris, who stopped 60 of 62 shots while the Irish split the series. This weekend, Morris will see a Michigan offense that has scored less than three goals only twice so far this season. This weekend will be the first conference series for the Wolverines, who had a split of their own last weekend against their in-state rival Lake Superior State Lakers. Both Michigan goaltenders, Hayden Lavigne, last year’s primary starter, and freshman Strauss Mann, got starts between the pipes in the series. Neither has looked particularly impressive this year, but Mann has had the slight advantage with a GAA of 3.05 and a SV% of .878 compared to 3.53 and .854, respectively, for Lavigne, who got the start in all five games against the Irish last year. A pleasant surprise for the Irish so far this year has been the offense from senior defenseman Bobby Nardella. The blueliner currently leads the team with 11 points, 7 of which are assists. The Irish will also rely on forwards Cal Burke and Joe Wegwerth, who have 5 goals each this season. You may remember Burke’s goal to break a 2-2 tie early in the 3rd period of last year’s Frozen Four game against Michigan. He’s my player to watch this series, especially if and when Lavigne is in net for the Wolverines. The next time these teams meet will be at Notre Dame in early January. As you may have heard, they’ll be playing in the first college hockey game in Notre Dame Stadium history. The stadium will also be the site for the 2019 Bridgestone NHL Winter Classic, as the Chicago Blackhawks and Boston Bruins will meet on New Year’s Day, four days prior to Notre Dame vs. Michigan. Yost Ice Arena is one of the toughest places to play, and I highly recommend watching a game there if you’re a college hockey fan. It’s probably not often I would pick a team to sweep the Wolverines at Yost, but I feel like things are coming back together for the Irish after their early struggles and it leads to them taking both games in Ann Arbor, where the trend of Notre Dame beating Michigan will continue.